Besan or gram flour is made from chickpeas and is highly rich in nutrients and fibre. It’s a great product if you’re trying to go gluten free. 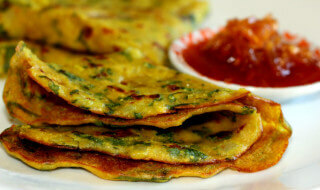 Besan chilla is easy to prepare. Check this recipe out if you’re planning to give it a shot. Combine the besan, corn flour, onion, green chillies, tomato, coriander leaves, black pepper powder, red chilli powder, chat masala, coriander powder and salt in a bowl. Add water to make a batter.Now heat a non-stick tawa and pour a ladle of the batter and spread it like a dosa. Pour 1/2 tsp of oil on the sides, and cook on medium flame until the side is golden. Now turn it upside down and cook the other side till it turns brown in colour and crispy. Serve hot.